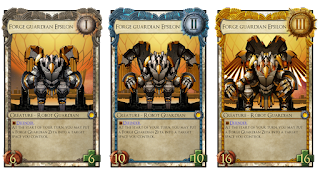 Strangely, Solforge is lacking in damage based AoE effects that only hit your opponent, with Epidemic being a debuff, Brimstone Tyrant hitting everyone, and so on (Chant of Dragonwatch is just not a card.). 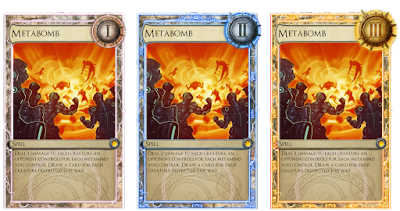 Metabomb would theoretically allow you to wipe their board, drawing cards to fuel Drix, or fish for Gnomes or some other card you desperately need, this is especially potent since metaminds have usually low attack and high health, meaning the AoE from this would help influence many trades (admittedly, you can't use Drix's activation pre-combat then), and you're likely to get strong Metabombs as Metaminds tend to stick around. In hindsight, the range of numbers are way off. Particularly at its later levels, when you several metaminds on the board, the damage it does can become a bit obscene. Probably should have keep the scaling constant and put a base damage at two and three. Oh well. 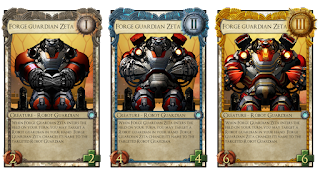 Zombies tend to fall into two distinct categories: Fat regenerating juggernauts, or cards that make a lot of small dudes. 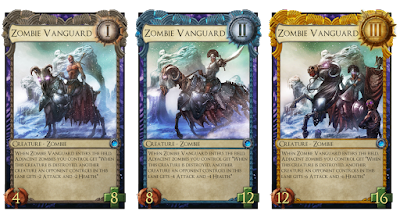 The proposed card is a pretty simple one, turning your otherwise relevant zombie tokens into Vengeful Spirits, allowing them to trade up. Also has pretty high health for Xrath's regenerate to work with. I have always liked cards that granted player abilites (granted, there are like 4 spells that do this), so making a tribal based player ability card seemed like an exciting prospect. Apart from Progeny of Xith, there are a bunch of throwaway abominations around, like Abyssal Maw and Direhound, so there are plenty of candidates for sacrifice. Although, I have no idea how good the card would actually be, seeing how its best case scenario, or ceiling is much much higher than its floor. I just couldn't resist making a Bron type card. The card is 'free' if you mount it on a dragon, but if you miss it and draw multiples with no dragon in sight, good luck. 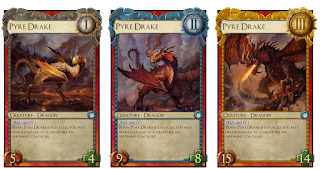 Pyre Drake is mostly a negative Solbind most of the time, being below curve in stats and spending a play to replace it and deal 4 damage is not very efficient either. 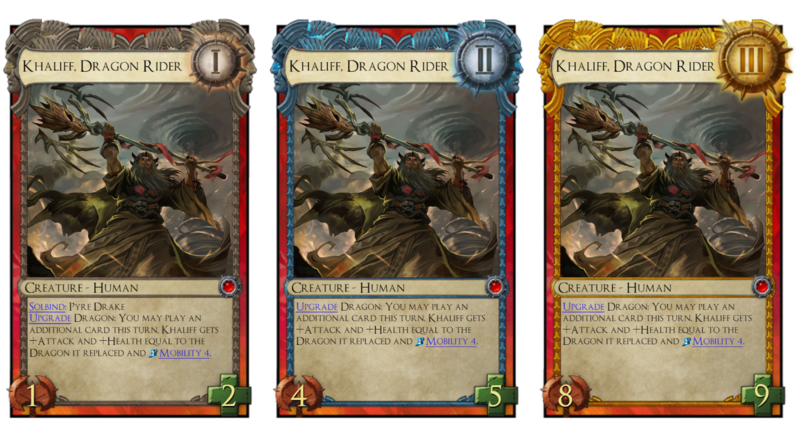 However, in combination with Khaliff, you get a 7/7 that deals 4 damage at level one, which is pretty good for one play. 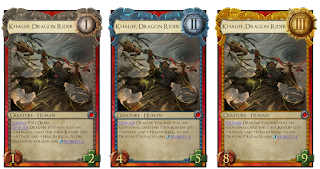 Khaliff also has notable synergies with Dragonwake, allowing you to 'keep' the dragon after combat, which can be very scary if you Dragonwake 2 a Scorchmane 3, for example. More player text! Although the way you go about this is semi convoluted. 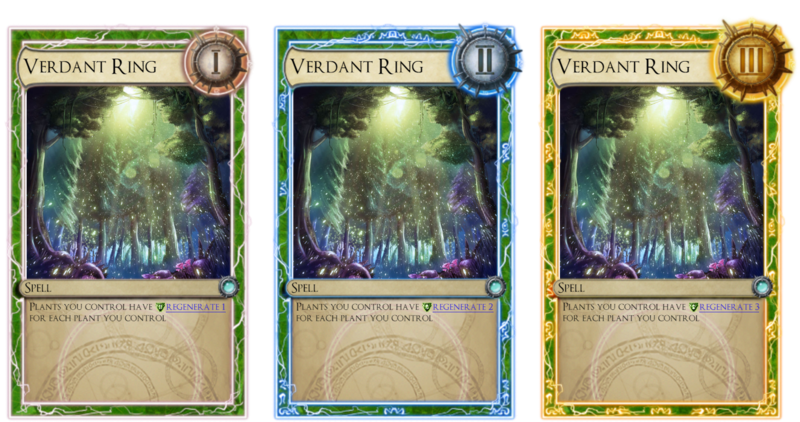 Many plants have fairly high health totals, meaning Verdant Ring can just make a board very sticky. Of course, having to invest two plays into getting minor regeneration onto your plants might not be very good at all. 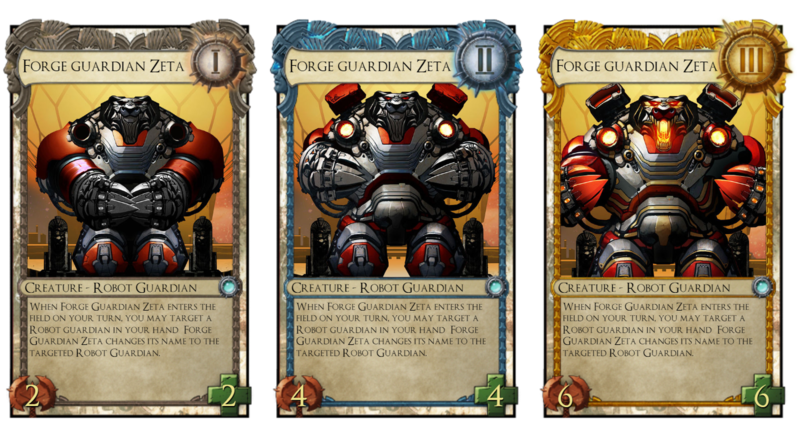 Who doesn't love Forge Guardians? 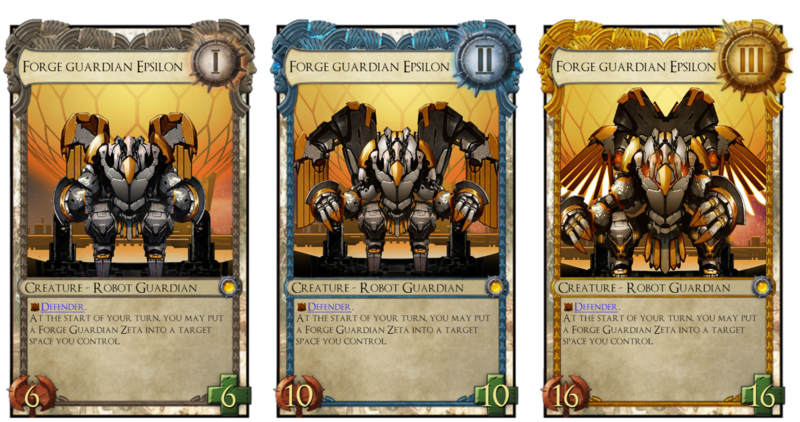 Getting Forge Guardians to stick is easily the hardest part about getting that sweet sweet Omega out, so both Epsilon being a defender and making little Forge Guardian tokens certainly helps in that regard. I imagine its actually also quite constructed playable, with both parts being Robots. Zeta's text is odd, but it basically serves to proc Delta easier. More Omegas for everyone! And that's a wrap on the second Wishful Thinking! 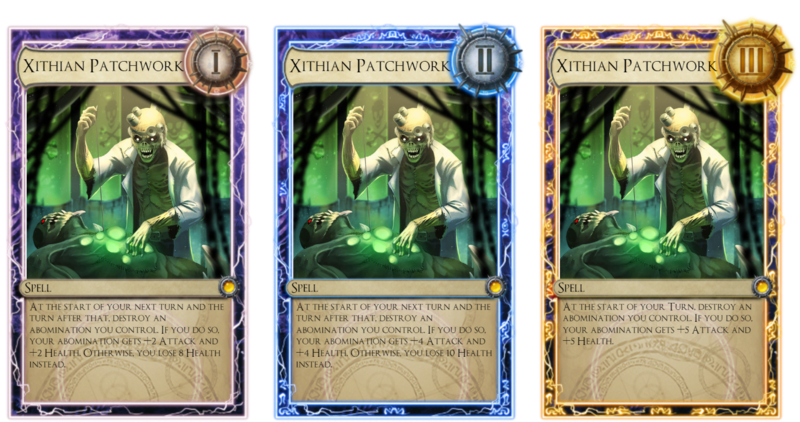 Again, do tell me what you think about the design of the cards (I am perfectly aware that the numbers are likely off). Until then, I'll see you all. Metabomb seems out of place for metaminds. The payoff is right, but metaminds aren't really supposed to get direct damage. 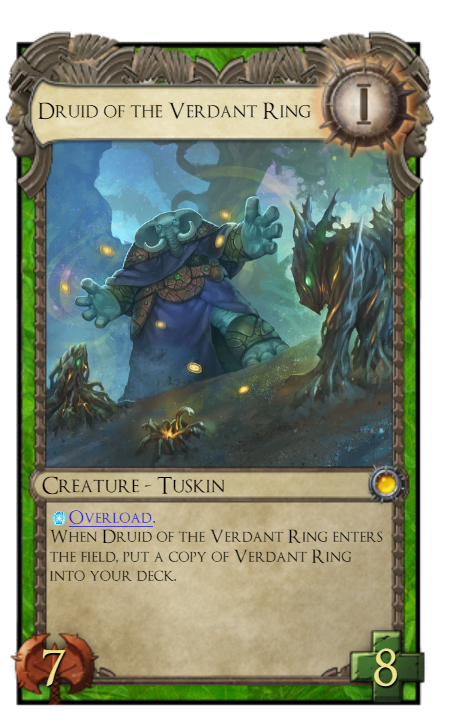 I might instead go for a card that focuses directly on what most metaminds do (I.E. more card draw/using card draw). 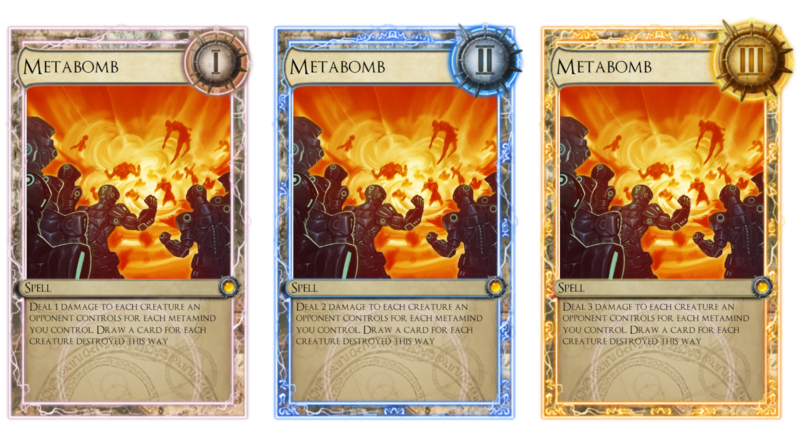 Lv 1: Draw a card if you control a metamind. I especially like how this plays very much into the alloyin draw/level strategy, acting like a conditional energy surge at lv 1 but turning into a potentially insane card draw machine at lv 3. Lv 1: 2/7 Activate: Discard your hand. Another target metamind you control gains health equal to the number of cards discarded this way. Lv 2: 4/14 Activate: Discard your hand. Another target metamind you control gains health equal to twice the number of cards discarded this way. Lv 3: 6/21 Activate: Discard your hand. Another target metamind you control gains health equal to three the number of cards discarded this way. Similarly, as you noted, zombies tend to care about regenerating if they're big or swarming/replacing themselves when they die if they're little so while vanguard supports them well, it doesn't really feel like a zombie itself. 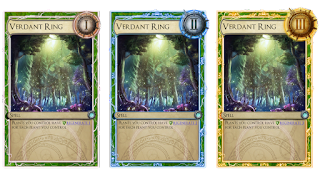 I would suggest something more along the lines of reviving adjacent cards in some limited sense. Lv 1: 4/8 When an adjacent zombie is destroyed, it is returned to play, gets -5/-0, and gets "if this card is returned to play it gets -5/-0 and this ability". Lv 2: 8/13 When an adjacent zombie is destroyed, it is returned to play and gets -2/-0, and gets "if this card is returned to play it gets -2/-0 and this ability". Lv 3: 12/18 When an adjacent zombie is destroyed, it is returned to play. 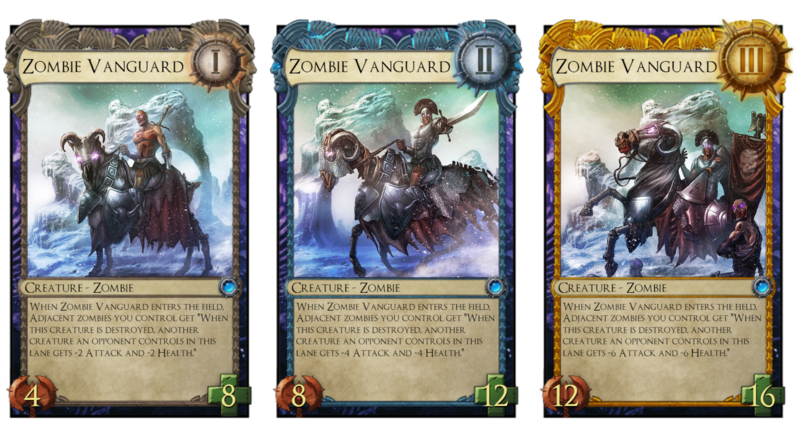 This generates value from adjacent dying swarms of zombies, much like your design, but does so in a way more in line with existing zombie cards, by reviving legions of zombies instead of by turning zombies into debuffs (which is more in line with what spirits do right now in game). 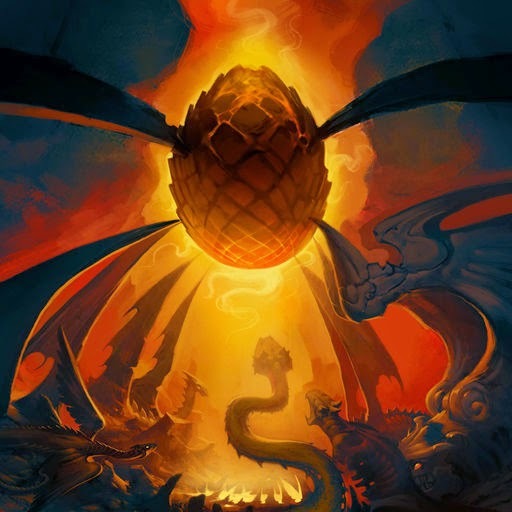 I think dragon tribal is intentionally not hugely supported because dragons are supposed to be individually exciting. Furthermore, due to the strong effects of most dragons, replacing them comes with a significant cost. 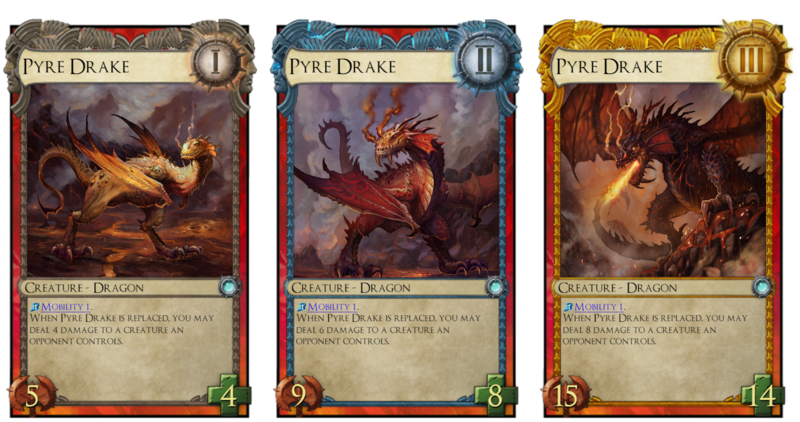 That said, if you were going to choose a way of supporting dragons, cards that encourage replacing are okay because they keep your lanes mostly open which helps the mobility many dragons have innately. I might suggest something which wants to be replaced by a dragon though, so you can keep the wow factor of the dragon itself. Lv 1: 0/1 When dragonmeal is replaced by a dragon, that dragon gets +1/+1, aggressive, and mobility 1. Lv 2: 0/1 When dragonmeal is replaced by a dragon, that dragon gets +3/+3, aggressive, and mobility 2. Lv 3: 0/1 When dragonmeal is replaced by a dragon, that dragon gets +5/+5, aggressive, mobility 4, and "this creature battles an additional time on each of your turns". 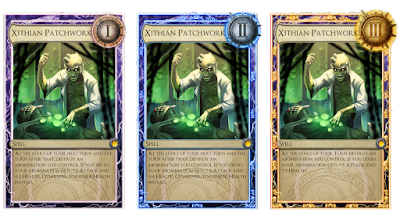 Your designs for plant, abomination, and forge guardian tribal seem to identify and work with the designs of those tribes though I might change the benefit on xithian patchwork from ferocious roar to epidemic. Also, the druid seems like a somewhat convoluted way of getting to the idea you want but I don't have any idea how to do it better.